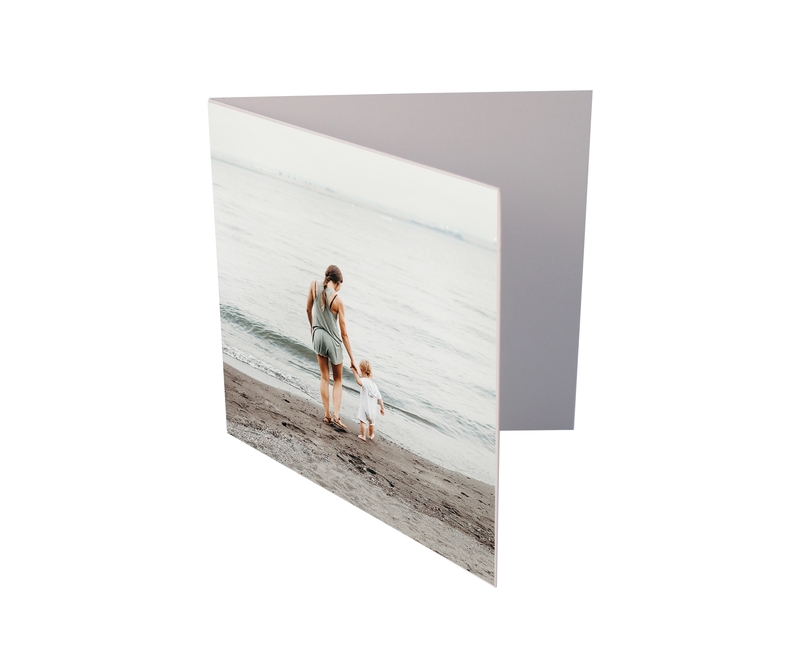 Our new photo greeting card range, The Designa Frame Cards, comprise of 3 popular sizes: 4 x 6”, 6 x 6” and a 6 x 8”, and are completely blank giving you plenty of opportunity for you to add value to your range - they are 100% customisable! These blank greetings cards are made with premium card stock for a quality feel and are 100% recyclable. They come in bulk in packs of 50 with a simple but patented adhesive strip feature which enables you to apply print easily and quickly. Just peel the adhesive off, line up the print against the edge of the card and press down. For every blank card, there is also a blank white envelope with easy peel & seal label strips. All sizes fall into the standard Royal Mail letter size also making postage cost efficient. These photo cards are blank on the inside meaning messages can be customised & tailored to your customer making it more meaningful for them and the recipient! Being blank means you can create a personalised card for every occasion, the possibilities are endless from traditional greetings cards such as Birthdays, Anniversaries, Mother & Father’s day to Party Invitations, Baby Showers & the whole range of wedding stationery from save the dates, invites, rsvp cards & thank you cards. There are hundreds of options, you can design themes and trend options for every taste, share this year’s memories, family holidays, new born photos and weddings and more. This simple blank design means you no longer have to stock a range of different designs. Simply stock the one blank card and just add the chosen design easily and quickly. Make your own cards, your way! This clever design is also craft friendly too so those who like DIY projects, these blank and easy to make your own cards will enable crafters to create their own range of cards not just with photos but with anything that fits.. they can try cutting up wrapping paper, or pretty card stock to add a real personal & creative touch.